H.M. Coastguard requested the launch of Lytham St Annes Mersey class All-weather Lifeboat Her Majesty the Queen early today (Thursday 27th July 2017) when a 26 foot (8m) long yacht with two people on board was hit by a heavy squall which roared through the area at around 10pm in the evening of the 26th. The vessel was heading for the entrance to the Ribble after a four day passage from the Isle of Wight when she was suddenly hit by an unexpected wave, larger than the rest running at that time, pushed on by the squall. The vessel broached, her stern slewed round which could easily have led to a capsize in less capable hands. The owner skilfully brought his yacht back on course but the inboard diesel engine powering the yacht had failed as a result. Continuing under sail alone, the two man crew brought the craft into the Ribble and headed up to Lytham in the blustery west-north-west force 6 wind blowing at the time. Unfortunately in her disabled state the fin keel yacht ran aground at the entrance to the Lytham Dock Creek putting her crew in danger in the strongly flooding tide and gusting winds so the lifeboat was called out to assist her to safety. The volunteer lifeboat crew were paged at 00.24am and the All-weather lifeboat (ALB) was on her way just seventeen minutes later under the command of Coxswain Gary Bird to launch at the 11½ mile perch in the Ribble. The lifeboat Her Majesty the Queen arrived at the casualty and managed to place lines on board and pull it off into deeper water before towing her part way up Lytham Dock Channel despite the wind having backed to west-south-west and increasing to gale force 8 at times. The Station’s inshore lifeboat (ILB) MOAM meanwhile had been launched under the command of Helmsman Ben McGarry in the more sheltered confines of Lytham Dock to tow the yacht up to her berth which was reached at 2.30am. After helping the yacht to safely moor and checking her two crew had no problems, the inshore lifeboat continued up the Dock to be recovered on shore at the Ribble Cruising Club slipway before being driven back to her boathouse behind the Station’s Land Rover. After washing off and refuelling, the ILB was ready for service again at 3.45am and the crew were able to disperse back home to their beds. 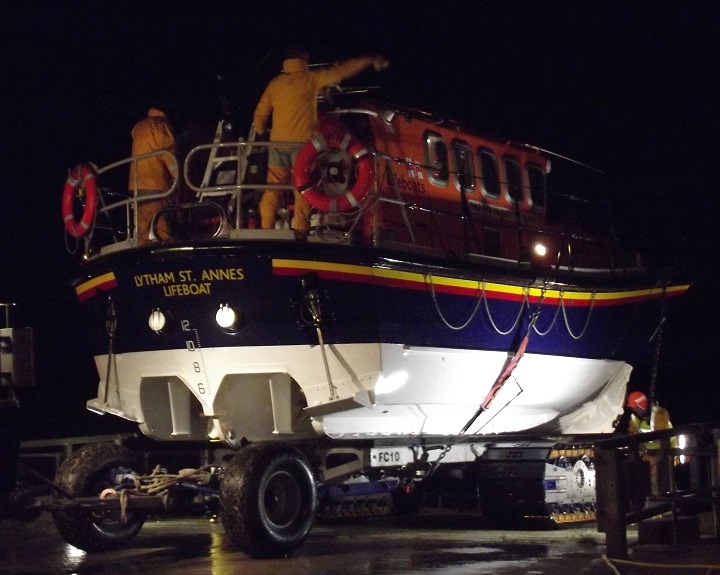 The All-weather lifeboat meanwhile had returned home, landing in front of the boathouse. As the beach was covered in water at high tide, the Talus launching tractor had to tow the lifeboat to “dry land” in the bay next to the pier before she could be recovered onto her carriage. After washing off and refuelling the lifeboat was housed and ready again at 3.47am with the crew being free to return to their homes just after 4am. Helmsman Ben McGarry of the Inshore lifeboat said on his return from sea, “The yacht owner did everything right in those conditions and was unfortunate to have been hit by the heavy squall. His skill was shown even more by the fact that he had just bought the boat and was bringing to Lytham for the first time”.